Derek Prendergast was wrongly shown a red card while Dundalk were held by Limerick and Bray Wanderers picked up their first win of the season this weekend. Bohs defender Derek Prendergast receives his marching orders. BY THEIR OWN admission, Dundalk haven’t clicked into top gear just yet. We saw signs that the revs were increasing last week when they dismantled Sligo Rovers, so perhaps it’s even more of a shock to see them drop points to a Limerick side that sat bottom of the league. It’s surprising on one hand that Dundalk didn’t see the game out after Richie Towell’s incredible strike, but even more surprising that they didn’t deserve the win. They kept possession well, but didn’t create enough to merit a second goal. Limerick worked hard, did their homework and played in a manner that should attract more people in the gate the next time they play at home. Paul O’Conor’s late equaliser is a good indication that Limerick have character, as well as ability. Derek Prendergast’s first half sending off was the game’s big talking point. It appears to have been a case of mistaken identity, as the centre-back was booked despite Lorcan Fitzgerald quite obviously being the culprit in taking down Cathal Brady. Lengthy discussions ensued following Paul McLaughlin’s decision – involving Bohs players, their bench and the referee’s assistants. Evidently, the official was told in no uncertain terms that he had erred in dismissing Prendergast, so couldn’t he have reversed his decision? Bohs won the game eventually, but they shouldn’t have had to do so with just ten for the most part. After back-to-back scoreless draws at home to both Cork and Bohs, the priority for Rovers was to beat Galway and get a few goals in the process. They did both of those things on Friday night but there’s still a sense that things haven’t clicked for them yet. Gary McCabe, Sean O’Connor and Stephen McPhail were all benched with Gavin Brennan, Marty Waters and Keith Fahey forming the attacking trio behind lone striker Mikey Drennan, who scored twice. The sooner Pat Fenlon can settle on his best attacking options, the better, it seems. Some Cork supporters had started to question manager John Caulfield after last week’s unconvincing win in Bray, but Friday’s impressive defeat of Derry City has silenced those doubts for now. Still undefeated and with five consecutive clean sheets in the bag, this was Cork’s most impressive display of the season. With new arrivals like Karl Sheppard, Liam Miller and Alan Bennett settling in seamlessly, the Leesiders look in good shape for another title challenge. They were on a different level to Derry, who don’t look like a team capable of challenging near the summit of the table. At the start of the week, Bray Wanderers looked like a club in crisis. Alan Mathews and his management team all stepped down. He was replaced by Maciej Tarnogradzki. Sligo Rovers fans would have been hoping that this was the day their season turned around. Bray, had other plans. They had very few chances throughout the game, but managed to win two penalties and score a decent third goal. It’s safe to say Sligo are in somewhat of a crisis at the minute – with the fifth highest budget in the league, they are currently struggling at the wrong end of the table. They have a mountain to climb should they challenge for Europe. A lot of Bray fans would admit that their aims for the season are just to survive. So for Sligo Rovers, a 3-1 loss to Bray is a massive dent in their season long ambitions. Email “Champions drop points, red card mix-up and the talking points from the SSE Airtricity League”. 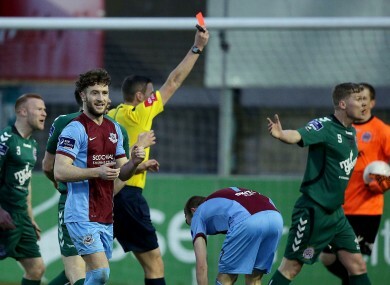 Feedback on “Champions drop points, red card mix-up and the talking points from the SSE Airtricity League”.